Steven R. Van Hook is a USCG Captain with 50-ton master, sailing and towing endorsements. He's an ASA certified instructor for courses in basic keelboat, coastal cruising, bareboat chartering, and coastal navigation -- specializing in custom instruction serving individualized needs. He's also a credentialed chaplain and counselor providing wedding services, burials and memorials on shore and at sea. UCSB international students from Germany with Skipper Steve at the helm. 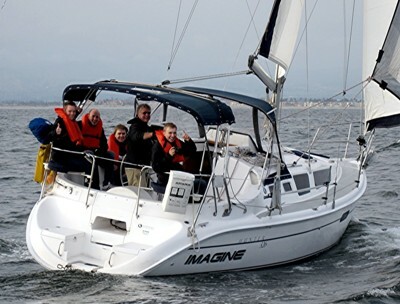 Glen-L powerboat in Santa Barbara Harbor, and currently on sailboats out of Channel Islands Harbor -- praised internationally as some of the best sailing waters in the world featuring year-round fair weather and bountiful sea life. Steven has worked internationally as a professional journalist. He's been a television producer, a newspaper features writer and columnist, a radio newscaster and reporter, a weekly radio talk-show host, a television news anchor and an NBC affiliate news division manager. He directed a nationwide television and radio public information program in Kiev, Ukraine. He managed a Washington-based television news service, and served as bureau chief in its Moscow office during the final months of the Soviet Union in 1990-91. Steven has spent several years teaching for universities in the United States and abroad, including UCLA, UCSB, and California Lutheran. He's also worked in social services, project management, and crisis counseling. Steven is president of Educare Research inc, a nonprofit organztion providing free learning resources to international independent educators and students. He has a PhD in Education with a specialty in transcultural learning, and conducts international multicultural research. He received a B.A. in Journalism and an M.A. in Business Communications.